What Happens When We Become Alarmingly Comfortable Driving with Cameras and Screens? Practically every new car on the road today is sold with some sort of camera apparatus or parking assistant, like a backup camera, one of those fancy bird’s-eye-view setups, proximity sensors and now, camera-based rear-view mirrors. I’m increasingly warming up to these things—but I wonder if I should be as comfortable as I am using these features. I was rolling down the road in the 2020 Range Rover Evoque in Greece last week (as one does) frequently checking its new digital rear-view mirror for the Greek drivers who, I was quickly learning, have little regard for keeping to their lanes, signaling, and passing safely. The picture in the rear-view mirror was so much clearer now that I wasn’t looking at a reflection of the roof, c-pillars, and rear row of seats. Instead I was looking at what a camera mounted on the roof was showing behind me. It’s a feature you can also find on a few other new cars, like the Cadillac CT6, and probably many more to come. The only downside is trying to fix your hair before remembering you to push a button to see the mirror again. Then later, when backing into a parking spot, I looked around and used my mirrors to make sure nothing was in my way. But as I backed up, I realized I was mostly using the backup-camera display on the center console, only checking my side mirrors one more time as I backed into the spot. I was almost completely relying on the little guidance lines on the screen to place the car within the lines. I also used Range Rover’s new ClearSight Ground View camera system that shows the ground below the hood of the Evoque so you can see pretty much exactly where the wheels are. I used the feature to get around a tight corner on a tall mountain road with no barrier between me and a big drop, making sure my wheel (or what the camera showed me to be the position of my wheel) didn’t go over the edge, and I didn’t even break a sweat. And then a couple of months ago, I was street parking an Alfa Romeo Stelvio in New York at night and in the rain, with very limited visibility, sandwiched between two other cars. I was essentially limited to either opening the door and sticking my head out or relying on the radar parking sensors and bird’s-eye-view camera to line me up with the sidewalk without bumping anything around me. That’s when I realized I’ve become entirely comfortable trusting a camera and screen to wiggle into spots, or show me what’s happening around me. The dilemma is that I genuinely think the systems I’ve used were reliable, accurate and effective—maybe even more so than just using my own eyes and traditional mirrors. I’m not so much alarmed with the effectiveness of the systems, but with how naturally and unconsciously I’ve adapted to relying on them after a lifetime of using my own eyes and head-turning abilities. Obviously I am concerned about everyone’s over-dependence on technology, which is certainly fallible. But am I too concerned? It’s worked out so far, right? If the features actually add a new layer of comfort, safety and convenience rather seamlessly, what’s the problem? Late last year, the National Highway Traffic Safety Administration conducted a study of digital side-view mirrors and determined that there were still many risks using the system, expressing concerns over visibility at night, distraction from lowering the viewing angle by having the screen embedded in the door instead of where a traditional mirror is located, and concerns over the likelihood of motorists acclimating to the new system. Cars sold in the U.S. are still not allowed to replace traditional reflective mirrors with digital side-view mirrors. However, the National Highway Traffic Safety Administration seems to justify the enhanced safety and usability of some of these features, making backup cameras mandatory on all new cars back in May of 2018. 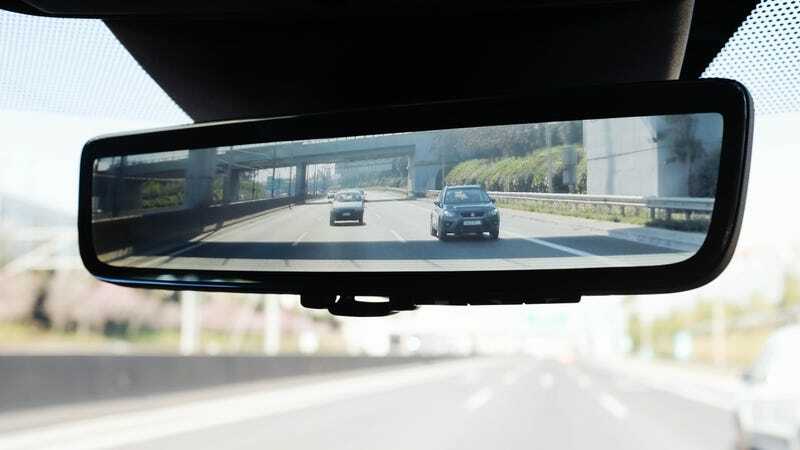 An Insurance Institute for Highway Safety study in 2014 found that drivers using a backup camera had the fewest collisions with stationary objects compared to drivers with no assistance, drivers using backup sensors alone, and even drivers using backup sensors and a backup camera. The Insurance Institute estimated in 2014 roughly 15,000 people are injured and 267 killed every year by drivers backing into them, with children and elderly individuals at a higher risk of being hit. NHTSA estimated up to 69 lives a year could be saved by making backup cameras mandatory. I still feel somewhat guilty every time I catch myself relying on a video feed. Maybe it’s because I still have parents who turn their head and look over their shoulder before switching lanes, or because I work for a website that’s one of the few I believe is rightfully skeptical of new car technology. But backup cameras aren’t taking control away from me. And bird’s-eye-view cameras, most of which are only activated at low speeds, aren’t distracting me. Digital rear-view mirrors only remove obstacles—of course as long as you’re driving with clean camera lenses. So what do I have to be worried about?